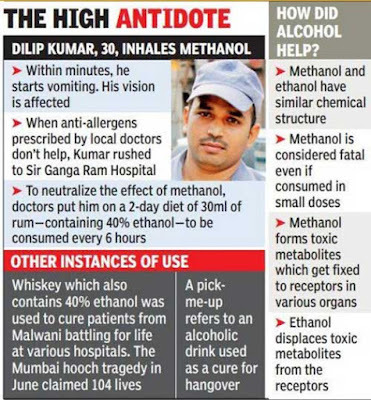 Booze is always considered as health hazard, especially in India. But would you believe if we tell you that alcohol can actually save a dying man’s life. Well not in every case, but in very different circumstances doctors have proved that booze can actually save someone’s life. Dilip Kumar who works as a pharmaceutical manufacturing plant in Delhi is a living example. Few months back, the 30 year old worker accidentally inhaled methanol while working in the factory which instantly caused the loss of vision and major side effects. When the first medical aid failed on him, the employers of the factory rushed him to Sir Ganga Ram Hospital. The doctors later reported that his eyesight is highly affected and his vital organs like kidney and liver had fallen drastically. It is then, the group of doctors decided to diagnose him small of dark rum which would ultimately neutralize the toxicity caused by methanol. This out of the box treatment was done along with hemodialysis and other supportive treatment. The patient who was actually a teetotaller, was given a 30ml of dark rum every 6 hours to neutralize the effect of methanol. At the same time several other dialysis was done to save his kidney from failure. Doctors upon asked said that alcohol therapy is not new and is commonly practiced in such cases. Methanol is a vital product in pharmaceutical industry. Dilip Kumar later said that, I have never consumed alocohol in my life. But when my family and doctors told me that I was saved by alcohol. I was shocked as well as surprised. Kumar has now resumed working at the factory and is living an average life after the accident. Since, he still suffers from problem where he cannot see sometimes from one of the eyes.